This screen displays the alerts produced by the MOREAL Decision Maker Engine. by multiple MOREAL alerts and threat events. Activity is analysed in regular time periods (time windows). The default time window is set to 1-hour in the current version. For more information, refer to the Decision Maker technical article. measurements were performed. The suspicious behaviour refers to this period. 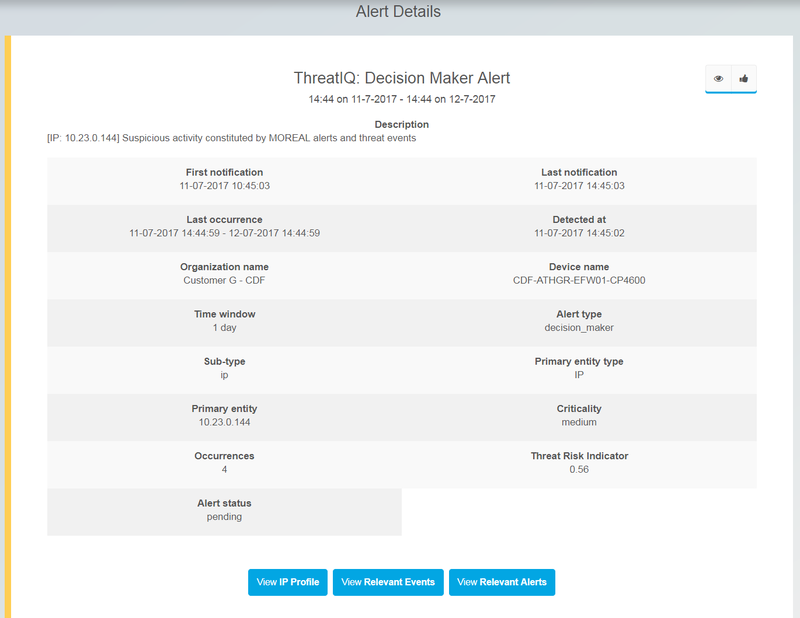 Detected at : The exact time when the Decision Maker detected a potential threat. the amount of evidence for raising the alert. entity (button: “View IP Profile”) and also links to relevant alerts (button:”View relevant alerts”). through corresponding IP Profile, Relevant Events and Relevant Alerts.